Big baseball day yesterday. Historic day. You know why. Ken Griffey’s retirement. Armando Galarraga’s perfect game. Much has been written about both. Here’s my two cents. 1. Griffey. Last August, I wrote about career RBIs and how odd it is that so little attention is paid to the leaders in this statistical measure. At the time, Griffey was 18th on the list. I speculated about how high he might climb. Griffey would hit only four more (see here for his career statistics), enough to move him ahead of Winfield and Palmeiro, but leaving him just behind my beloved Red Sox heroes, Ted and Yaz. A minor matter. I just wanted to bring the topic to a close. Let me move on to Griffey’s greatest moment, for which I had the good fortune to be at the Kingdome. I wrote about the game— the 5th game of the Yankee-Mariner 1995 playoff series — a year ago, so I’ll be brief. You can study the box score and play-by-play here. The winner of the game would go on to face the Indians in the American League Championship Series. After many twists, the game entered the eleventh tied at 4. The Yankees took a 5-4 lead in the top of the 11th. Joey Cora led off the bottom of the inning with a single. Griffey followed with another single that moved Cora to third. Up came Edgar Martinez. He hit a double off the left field wall. The Kingdome went crazy. From the moment Edgar hit the ball, we knew the score was tied. But no. Griffey was waved on. He kept running. And he scored. We won! We won! It was unbelievable. Two pile-ups ensued. At second base, surrounding Edgar. 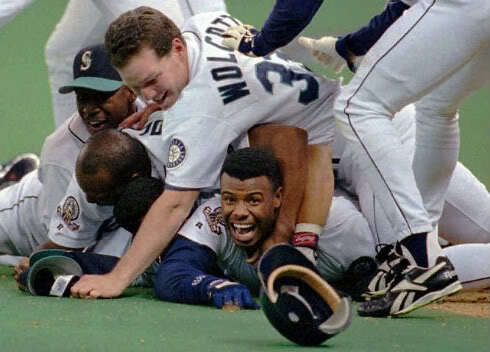 And at home plate, Griffey looking up from the bottom of the pile with a grin of joy. He was one of the great hitters of the era, and its greatest outfielder. But his most magical moment was that dash from first to home. 2. Galarraga. I wrote a few weeks ago that “Perfect games are rare. When one is thrown, attention must be paid. Today, Dallas Braden of the Oakland A’s threw the nineteenth perfect game in baseball history, against the Tampa Bay Rays. I’m paying attention.” (I also explained that “a pitcher throws a perfect game when he pitches nine innings [or more, if necessary] and retires every batter he faces. No opposing batter gets on base, whether through a hit, a walk, an error, being hit by a pitch, or any other means.) Little did I know that two more perfect games would soon be thrown, just days apart. Last Saturday, Phillies’ new pitcher Roy Halladay threw a perfect game in a 1-0 victory over the Marlins. ESPN switched from women’s college softball to the game for the 9th inning and we turned to it from men’s college lacrosse just in time to see the end. From what we saw and what I read, he was so masterly that the outcome almost seemed inevitable from early on. 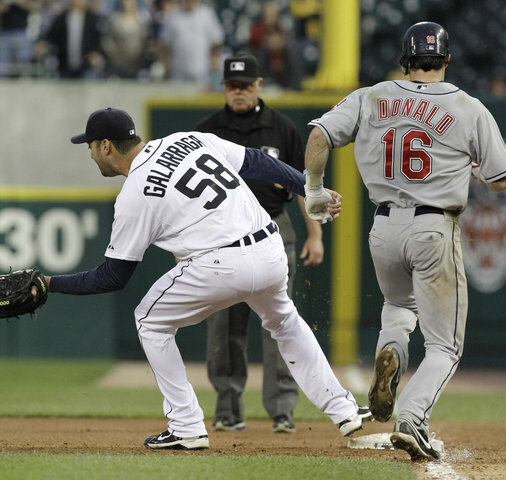 Last night, Tigers pitcher Armando Galarraga threw yet another perfect game in a 3-0 win over the Indians. Alas, as all the world now knows, it wasn’t so perfect after all, because first-base umpire Jim Joyce, to his eternal regret, made the wrong call on Jason Donald on what would have been the 27th and last Indian out. Donald hit a grounder to Tiger first baseman MIguel Cabrera. Galarraga ran to first to take the throw from Cabrera. Cabrera threw, Galarraga caught it, Galarraga stepped on first base, Donald stepped on it afterwards (thereby being out), Galarraga threw his arms up in celebration, the crowd cheered, but Joyce unaccountably called Donald safe. I could say more, but Joe Posnanski, in a blog post this morning, said it for me (and better). The way he handled himself after the game, well, that was something better than perfection. Dallas Braden’s perfect game was thrilling. Roy Halladay’s perfect game was art. But Armando’s Galarraga’s perfect game was a lesson in grace. And when my young daughters ask, “Why didn’t he get mad and scream about how he was robbed,” I think I will tell them this: I don’t know for sure, but I think it’s because Armando Galarraga understands something that is very hard to understand, something we all struggle with, something I hope you learn as you grow older: In the end, nobody’s perfect. We just do the best we can.